When you've been to the same city 9 times in 3 years, you begin to feel like a local. This is the case for my husband and I in New Orleans. We have a routine, we go to the same restaurants and are almost in a rut (a rut we love). We decided to do a few things different this trip. We went on a tour, museums and had a wonderful experience. 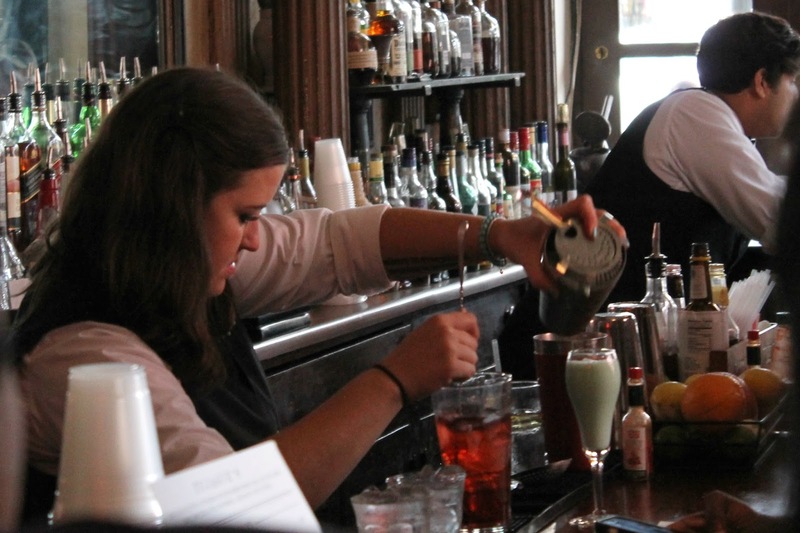 We went on New Orleans Original Cocktail Tour and had no idea what to expect. The last thing either of us wanted was a booze fest bar hop and thankfully this tour was far from that. We did not visit Bourbon Street but instead, 4 of New Orleans classic Bars. This 2 1/2 hour walking tour is full of culture and history of the city. Our tour guide was very informative and we learned so much about the city we have been to 9 times already. There are multiple bars they choose from and on this tour, we visited Tujague's, Pirates Alley, Court of Two Sisters and Antoine's - we had only been to one of those 4 locations in our past. Tujague's was established in 1856 and is full of history. This is the oldest stand up bar (no bar stools) in America. The grasshopper was invented here and the word Brunch was started here! This restaurant has a guest book which goes on for days. I had a Pimm's Cup and Gabe had a Grasshopper to start off our Cocktail Tour. Tony Seville's Pirate's Alley Cafe was our second stop. This was the one location we have visited before - on our first trip to New Orleans together. It was a stop on a ghost tour and this alley is said to be very haunted. This is also one of New Orleans Absinthe houses. Absinthe was banned in 1912 in the United States but made legal again in 2007 in 8 states, Louisiana being one of them. I wasn't a fan of the green fairy drink the first time I had it and I stand firm on that the second time around. Luckily, we learned our lesson the first time and split one vs. getting two. Very cool bar though - and they do have much more than Absinthe. I strongly suggest anyone going to NOLA to have at least one cocktail here (it is cash only). The Court of Two Sisters was our third stop of the tour. While I've never dined here, I am very familiar with their famous Sunday brunch. We typically leave on Sunday's and have yet to experience the Jazz brunch but I was excited to see the inside of this gorgeous restaurant. Around 1886, this property was bought and turned into a dress shop called The Shop of the Two Sisters. It was the finest shop in the town and specialized in formal gowns and Mardi Gras costumes. 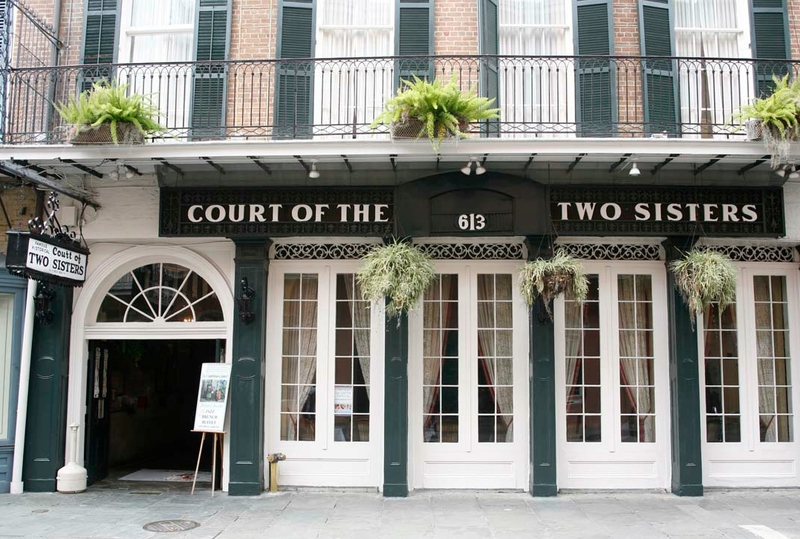 Over time, the property was passed through multiple ownership's, eventually turned into The Court of Two Sisters in 1963 and has been a popular New Orleans establishment ever since. We tried two different drinks at The Court of Two Sisters - their signature cocktail, the Bayou Bash and the Golden Coconut. It is also believed to have the best mint julep in town. Mint Juleps are very strong and we had one last stop to go. 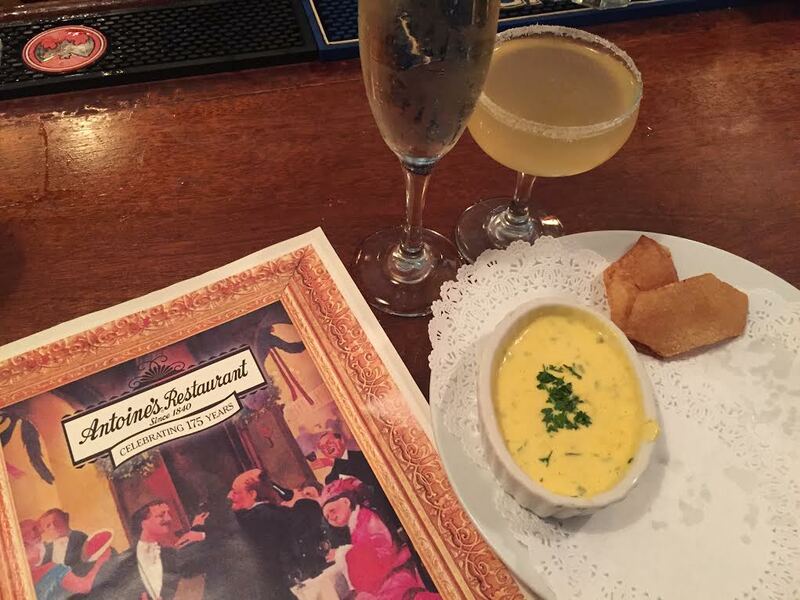 Our final stop was Antoine's Restaurant, the country's oldest family-run restaurant. Antoine's is a massive establishment, with multiple dining rooms and private dining areas. Multiple presidents have dined here and there is even a Mystery room, which came from the prohibition era. All the dining rooms are adorned with photographs and memorabilia from it's famous diners. We arrived at Antoine's during happy hour and I was delighted to learn that champagne was $5 a glass. Gabe went with the Side Car. We were both hungry and learned of an appetizer which cannot be missed here. The Souffle Potatoes, a fried puff potato. While it may not sound special - it truly is. Antoine's is one of 3 places in the world who can make this dish. It's a deep fried potato, double fried at 800 degrees, which makes the insides explode. It's essentially a hollow potato puff and out of this world delicious. Other fun facts from the tour: it is said New Orleans invented the cocktail! The Sazerac was the pioneer, where an apothecary by the name of Peychaud (of bitters fame) served a mixed brandy drink in a French eggcup. Eventually the drink was named coquetier, the French term for an eggcup. Peychaud's guests shortened the name to “cocktay,” and eventually it became “cocktail. 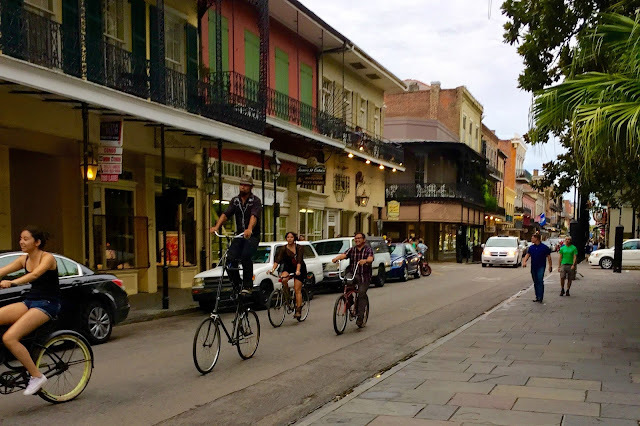 If you are in New Orleans and looking to mix fun with culture and history, I strongly suggest the Original Cocktail Tour New Orleans. It is $29 a person and drinks are not included. However, you learn so much about the city. Both my husband and I would do this tour again in a heart beat. Disclaimer: New Orleans CVB provided me with comped tickets to this tour. You can find tours like this and others on their website, facebook, twitter and instagram. As always, all opinions are my own. I have yet to go to New Orleans, and I realllllly need to change that!